No choice but to. . .
ranging from the Executive Officer on a U.S. nuclear submarine to an anti-PC lawyer to a paralyzed police officer. 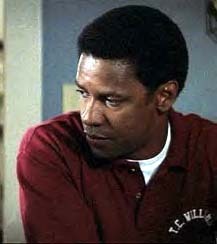 Denzel Washington is the real deal when it comes to acting. It is almost impossible to look at a list of his movies-- and it is a very long list--and find even one in which he performed poorly. In a career that spans two-and-a-half decades, Washington has been one of the most prominent faces in Hollywood, and most often his performances make clear statements on a variety of societal issues. "Glory" was hyped and perceived as a war movie, but it contained underlying themes of slavery and segregation. "He Got Game," while very much a basketball movie, also took a serious look at the sometimes strained relationship between father and son. And "Crimson Tide," a suspense film based on a U.S. nuclear submarine, analyzed the decision between following orders and doing what you know is right. Washington has done it again this fall, in the latest release from Walt Disney Productions, "Remember The Titans." Someone somewhere inside the brilliant PR machine that is Hollywood advertised the movie as a football flick to draw more male fans to the theaters, but it takes about two minutes to figure out that under the football mask lies a movie that documents the troubles of racial integration and separation. And, as is par for the course, Washington turns in yet another award-worthy performance. "Titans" is based on the true story of T.C. Williams High School in Alexandria, Virginia, and Washington plays Herman Boone, the African-American coach who is hired to lead the school's first football team. Williams is the first high school in the area to accept both black and white students, and it falls on Boone to hold the football team together after the popular white coach is demoted to his assistant. Boone adopts a perfectionist attitude with his team, requiring that they do everything correctly, and also forces players of both races to spend time with one another. Eventually this makes the team close . . . until they return to start the school year, and encounter friends and faculty members who still harbor the same racist feelings. assistant coach who is forced to make a choice between his own personal fame and what is right for the team. Other noteworthy performances are turned in by Wood Harris and Ryan Hurst (both of whom have never had any major roles) as the main black and white players, respectively, on the Titans' team, and Hayden Panettiere (voices in "Dinosaur" and "A Bug's Life") as Coach Yoast's sideline-roaming daughter. And, being that Jerry Bruckheimer is one of the producers, it is almost a given that the football action is done very well, and he ensures that the movie is able to be appreciated by your average potbellied 24-year-old male who only went to the movie because he saw a brown oval ball. However, at the end of the movie it is Washington who outshines everyone, and who makes this movie the smash hit it is likely to be. His brilliant performance is the difference between "Remember The Titans" being a critically acclaimed drama with Oscar potential and being just another football movie. You can add this movie to the long line of films that will ensure that you will remember Denzel Washington long after "Remember The Titans" is out of the theaters and into home video collections.